SU11C is Easy operation, powerful functions and healthy fashion. It can be applied to different occasions like Travelling, Sport, Driving, Social networking etc. It will be a part of your life. Advanced Configuration & Extraordinary Experience: - Built microphone, Speaker, Camera - Independent SIM Card for phone call and message notification - Various Sensors, Allow the watch to known better of yourselves. Multiple Straps Diverse Style: - The watch configured with first layer leather strap, matched with black and brown classic colors. Allow everyone to switch the unique style freely. - The strap adopts the common 22MM, which one can buy from the market to change easily. Stylish Design, Ultimate Slim: - Exquisite Craftsmanship - Details highlight fashion - Arc Design make the overall shape smooth and natural - Perfect fit your wrist Feature: - Call function: Making independent calls as a mobile when insert SIM card. - Bluetooth connection for recording and playing mobile music and collecting data. - Pedometer: Advanced algorithms, high precision sensors. Every step is accurately recorded. Monitoring the steps and calorie consumption. - Sedentary Reminder: Monitoring activities through a built-in sensor. - Sleep Monitoring � Monitor sleep quality through precision sensors including deep and light sleep. - With 0.3MP Camera for recording and photographing - Remote Capture � Mobile phone camera can be remotely controlled by the watch to take a shot. - Media Player � With TF memory card to play music / video randomly. 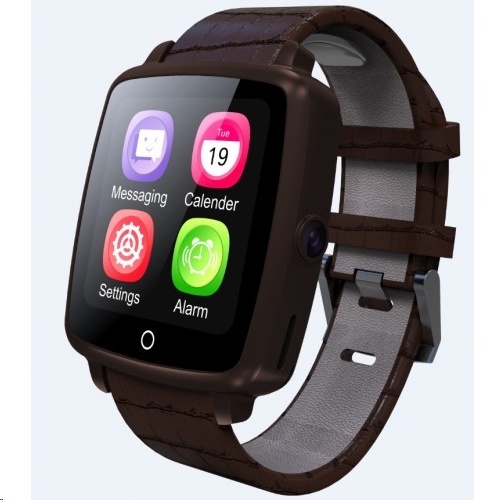 - Smart Compatible Connection - Support IPhone 5 and IOS 8.0 & Android 4.0 or above - Auto-light up screen � Rotate the wrist 90 degrees, the screen automatically light up. Specification: GSM (Nano SIM): 850/900/1800/1900 Memory: Support TF Card Bluetooth 3.0 + BLE 4.0 1.54 inch High Density Capacitive Touch Screen Display Resolution is 240 x 240 Pixels Camera at 0.3MP Rechargeable Lithium-ion Battery 360 mAH Standby Time: 5 Days Watch Size: 52 x 41 x 10.9 mm Watch Size with Strap: 260 x 41 x 10.9 mm Weight of Watch: 54.8 grams Colors of Watch: Brown, Black, Silver Color of Strap: Black, Brown Material of Watch - Zinc Alloy Material of Strap � Leather This product is complied with world class safety regulation passed the CE certification, Quality Inspection System Certification, ROHS and Design Patent.